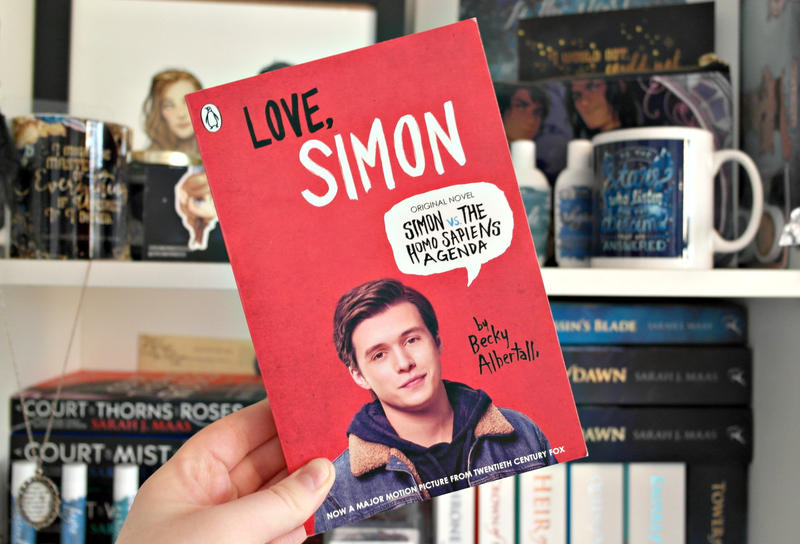 As I am a member of the fab bloggers group at my local Waterstones in Manchester, I very luckily received a copy of Love, Simon (Simon vs The Homo Sapiens Agenda by Becky Albertalli) at the latest event, as Penguin had decided to work with us which is exciting! I had heard a lot of great things about Love, Simon and as the film was coming up, I already wanted to read it so being able to get my hands on it was awesome. Keep reading for my spoiler free review. Love, Simon was an honest, loving, funny, emotional, warm-feeling-in-the-stomach kind of read. There was so much representation in this book through different sexualities and ethnicities and while I cannot comment on whether the representation was accurate (though I’ve read a lot of Goodreads glowing reviews over this), I think it’s awesome that it was included. And not like “hi this representation is right in your face so that you know I’m including a diverse cast”, but in a subtle “yeah this feels perfect” kind of way. For me, the characters were the biggest reason why I enjoyed this book so much. Can I be part of the gang with Leah, Nick, Abby and Simon? The friendship group went through the ups and downs we all experience when we’re teenagers, including disagreements and bickering, but that just made it feel so much more real to me. Simon also had a wonderfully supportive but often crazy family which just added another layer to the story, touching upon how parent’s can react to you coming out in a different way than your peers. The high school experience depicted throughout the book was very relatable to me personally, in the sense that it was very realistic. Some high school contemporary reads are so above and beyond the realms of possibility that I often zone out – this definitely was not the case with Love, Simon. There were a lot of cute and adorable moments which for me truly represent that feeling of first love, along with some not so nice moment when Simon’s classmates decided to make a joke out of his sexuality. I love how this was handled by one of Simon’s teachers who completely shut them down and I hope that most teachers are like this when they come across bullying! Not only did I love the characters, but the book included nods to popular culture which I loved, there was a constant element of mystery as I tried to figure out who Blue was and an overwhelming feeling of love and positivity towards Simon – I just wanted him to be happy! This book also included a very powerful message about embracing yourself which I think is so important. Whilst not my typical genre of choice as I tend to pick fantasy over contemporary, I loved this story all the same and it was a definite 4/5 stars for me! Edit: I saw the film this afternoon and oh my gosh, it was incredible! I laughed, cried, smiled, got butterflies – the lot. It was such an uplifting and romantic film and I just need more! Whether you have read the book or not, I implore you to go and see Love, Simon.